Who doesn’t dream of winning the lottery – with the possible exception of past mega jackpot winners of course! That said, even Donald Trump himself might be swayed by the 488 million dollars of virtual prize money at stake in the latest Mystery P.I game from puzzle specialists PopCap, Mystery P.I: The Lottery Ticket. Put simply, the objective of Mystery P.I: The Lottery Ticket is to locate hidden items dispersed throughout the city to progress to each new level. At the end of each level you are also required to seek out the hidden jigsaw pieces, of which there are 20. In doing so you will complete the puzzle to unlock the bonus stage which in turn unlocks the final level where the missing lottery ticket can be found, aka pay dirt! Mystery P.I goes easy on you at first by giving players a fairly short list of items to find within different locations within the city. The earlier stages each require you to find around 20 different objects per level to progress onwards. This increases to around 80 plus on later stages. Despite the relatively high number of objects to locate down the stretch the game never gets boring and instead compels you to keep hunting as the timer steadily counts down to the twelfth hour. Even at it’s most challenging, this addictive little scavenger hunt never devolves into a needle in the haystack affair and rewards players for quick thinking and accuracy by giving extra points if you find the items quickly. PopCap certainly aims to challenge even the most seasoned of gamers and puzzle game veterans. Players may initially find success by scanning locations for collectable objects by their individual colours but time is quickly called on that tactic and, as is to be expected from any good puzzler, as the game progresses so do the complexity of the levels. For example, some areas later in the game are based underwater which not only provides objects with a unique new perspective but, as with the lounge levels, means that objects are incredibly well disguised with many being of a similar hue to the background scenery and very difficult to spot at first glance. Furthermore, as players progress more and more random objects appear making it even more of a challenge to find the ones needed. There are hints available to players at any time although these come at a price with 7500 points being deducted for each one used. That said the actual learning curve isn’t too steep and the game does a great job of easing the player in to the action and remains fun throughout it’s 20 levels. After finding the required amount of items needed to progress to each new level you will be presented with a mini-game in the form of a memory test. This can get a little repetitive but each memory game smartly requires a you to not only group objects that match by colour but also by use. For example, a tennis ball and a tennis racket or a horse and a horse shoe. After finishing each memory based mini-game you will be given a piece of a jigsaw puzzle. PopCap have also included additional mini-games within each of the city’s different locations giving players the option of finding up to 20 cleverly hidden keys which can be used to unlock bonus game modes such as Unlimited Seek and Find. In Unlimited Seek and Find players have no less than 2000 hidden items to find within each of the locations that appear on the game map (including bonus areas) increasing the longevity of the game considerably. 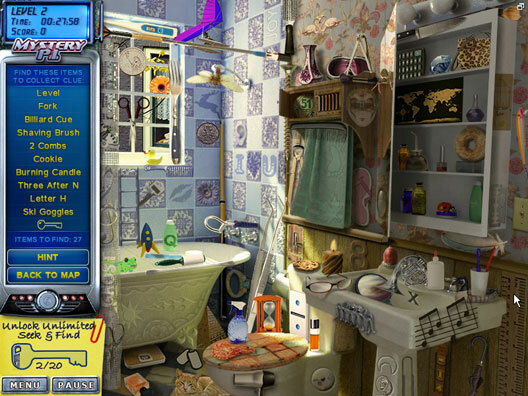 Its fairly commonplace for hidden object games to re-use locations and true to form Mystery P.I: The Lottery Ticket does exactly this. However, I actually found this helpful from time to time as revisiting certain areas enabled me to find keys that I missed upon my first visit. 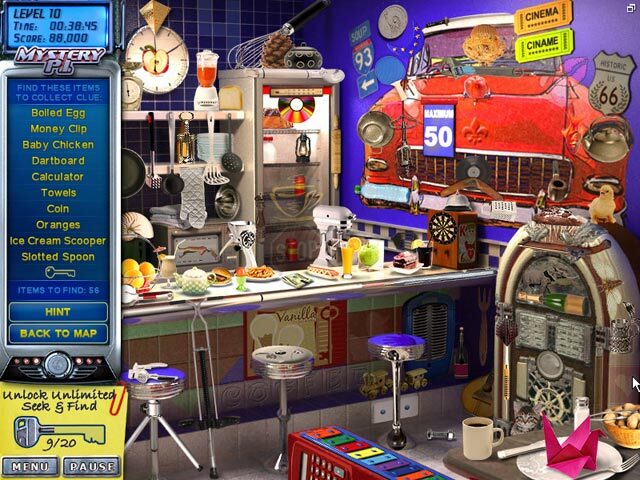 Mystery P.I certainly gets a thumbs up for it’s clever re-use of existing locations in this manner and as repeat play reveals you never seem to find the same item in the same location more then once or twice. 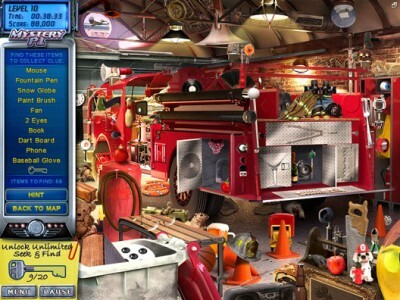 This not only introduces a random element into the game but also requires that players continue to rely on skill and not memory, something which has marred other hidden object games in the past. Occasionally the game can get a little testing when it comes to finding certain smaller objects especially as there is a tendency for them not always register on your first mouse click, particularly if they are surrounded by other items. Sometimes it can take several attempts to collect an object with each previous click costing you the valuable points needed to amass a high score or purchase clues. PopCap have come up with some pretty ingenious items for you to find over the course of the game and have really gone out of their way to try and fool players and keep them guessing throughout. During one of the levels for example you have to find five spots which I incorrectly assumed would be five different spots… In another location you are required to find two bats, turns out only one is a mammal! Mystery P.I definitely encourages out of the box thinking with some fairly wild resolutions.